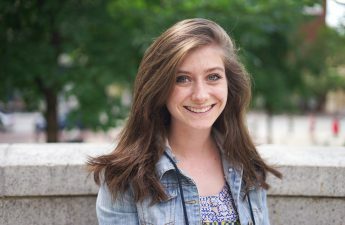 It was one of many times that Catherine Palm was acutely aware of being a Deaf student in a hearing world. The audio on a video her professor wanted to play wasn’t working. The captions were still available, though, so her professor started the clip without sound. Palm breathed a sigh a relief. Professors often forget to turn on the captions when playing videos. This time, she’d be able to understand the content for her class. But mere seconds into the video, Palm’s classmates started complaining. The captions were too fast. They blocked the screen. They couldn’t see. It was too annoying to read. Palm’s professor stopped the video. He said he’d fix the audio so they could listen to it for homework. Palm went numb. Then her pulse started to rise. She’s spent her whole life asking for captions, hoping there would be captions, feeling relief when they’re provided and feeling frustration when they’re not. For deaf and hard of hearing students at the University of Wisconsin, these situations — where hearing students lack knowledge and understanding of Deaf experiences — are commonplace and can lead to microaggressions, accommodation refusals and sometimes discrimination. And though unintentional, the indifference to Deaf culture permeates through campus. American Sign Language courses are not regularly offered. Deaf experiences aren’t included in the diversity conversation. Deaf culture is not a prominent part of UW’s history. And the voices of Deaf students are often silenced. The problem starts with a lack of knowledge. UW freshman Joon Jang, a hard of hearing student who has hearing aids, said students expect there to be diversity in terms of race or backgrounds when they come to UW, but they don’t expect to see a range of physical accommodation needs. “I wish people were more aware that … hearing disabilities exist,” Jang said. Alyssa Wciorka, a sophomore majoring in psychology and communication sciences and disorders, said people don’t realize there is a spectrum of Deaf individuals. Hearing loss can range from slight to full loss, and some use hearing aids or cochlear implants for assistance. Wciorka was diagnosed with severe and profound hearing loss when she was one. At age two, she started using cochlear implants. Her cochlea — the portion of the inner ear that receives sound vibrations — doesn’t function properly, so the implant replaced parts of it. An external microphone and sound processor, which sits in Wciorka’s ear, sends signals to the internal implant. This allows her to hear sound that is “very, very degraded” — about 16 electrodes compared to the thousands of channels you get with natural hearing. Others have full hearing loss and do not use cochlear implants, using sign language to communicate. These individuals are known as culturally Deaf, and they have varying levels of integration with the hearing world. Some know sign but still hang out with hearing individuals. Others interact primarily with others who are culturally Deaf. Many hearing people have never met a Deaf person, and make assumptions about what they don’t know. One of the most pervasive misconceptions about deaf and hard of hearing people is that they are incapable. Palm said people think she can’t drive or read since she is deaf. 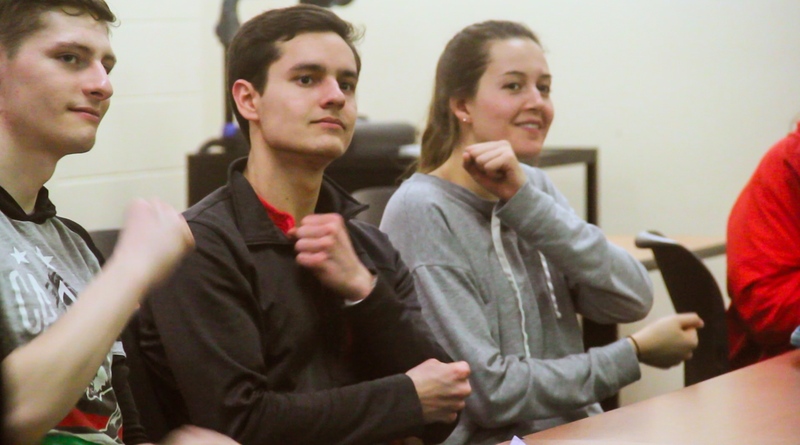 Kate Lewandowski, McBurney’s accommodation specialist for deaf and hard of hearing students, said students commonly tell her about being passed over in class or during group projects because it’s assumed that they can’t participate. Professors also frequently forget to turn on captions for videos. Wciorka said her professors will sometimes talk to her captioner instead of her as if she can’t communicate on her own. “Deaf and dumb” is a perception many still hold about the deaf and hard of hearing community, Lewandowski said. 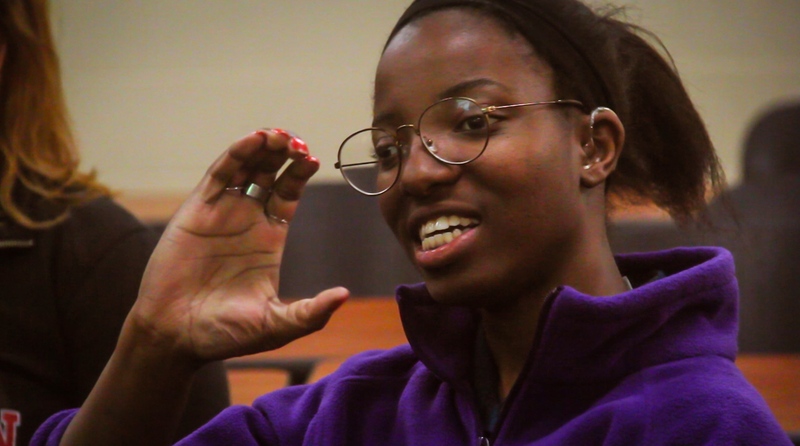 UW senior Acheh Fonkem, a deaf student majoring in zoology, said some of her friends have made comments about her deafness like “see, even Acheh could hear that.” And if Fonkem can’t catch everything in a conversation right away, sometimes people will just give up on her. For Lewandowski, there have been multiple times where restaurant employees will bring her a menu in braille, assuming that she can’t read. She’s also had airport security bring her a wheelchair after a flight, as if being Deaf means she has issues walking. Hearing people also assume that if a Deaf person can’t speak orally or if they have a Deaf accent, then they aren’t intelligent. Lewandowski’s husband, who is Deaf and has a pronounced Deaf accent when speaking, is often dismissed or talked to like a child. People make the same assumptions about those who can’t read lips, but lip reading takes a lot of in-depth training, which most deaf students don’t have, Palm said. Fonkem said people often talk louder, slower and over-enunciate when speaking to her. But Fonkem, Palm, Lewandowski and Jang said speaking louder doesn’t mean they’ll be able to hear someone better. Fonkem can’t hear, so talking louder is useless. Jang can hear people talking unless there’s a lot of background noise. Another common misunderstanding is that sign language is a disjointed or broken language. Katie Hustad, department chair of the communication sciences and disorders department, said ASL has its own rules, consistent word order that is unique from spoken English and is socially accepted by a community. ASL is its own vibrant language. 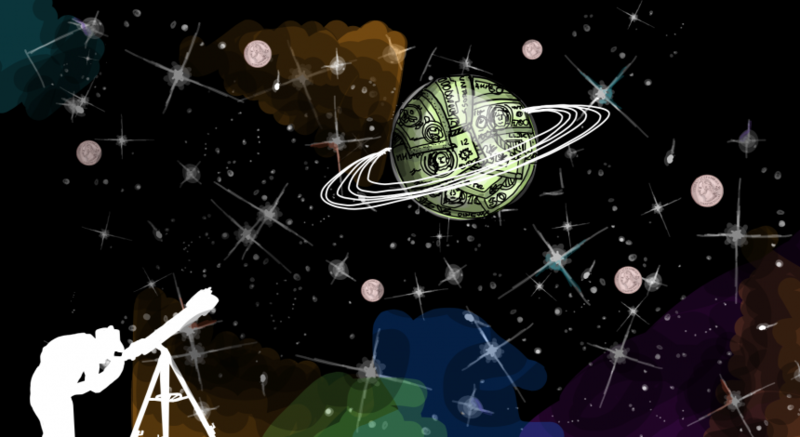 And along with the language, comes a rich and diverse culture. Fonkem said she’s still learning about Deaf culture, but “it’s beautiful.” When she meets someone who is Deaf it’s something they can bond over. 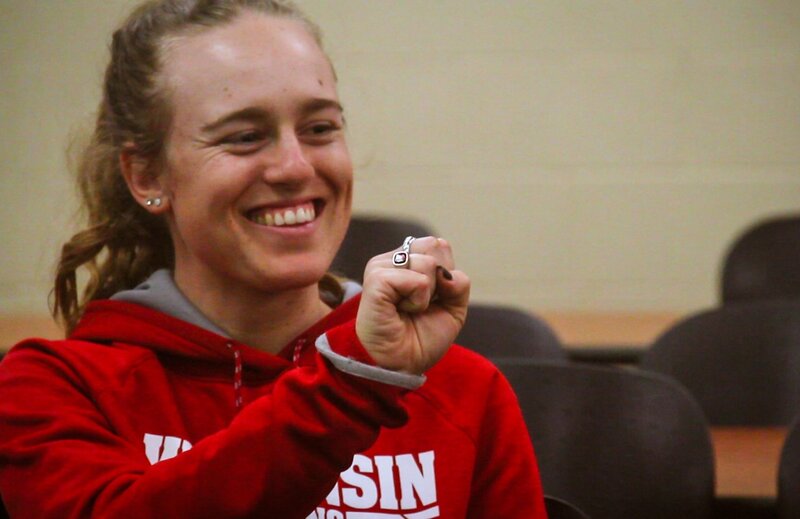 Acheh Fonkem helps teach sign language to members of UW’s Sign Language Club. The Deaf community shares language, history, traditions and values, Lewandowski said. When Lewandowski’s within it, she doesn’t have to explain herself. She can talk freely with no barriers. She’s safe. Palm said being deaf is a part of who she is as a person. But on UW’s campus, Deaf culture is something that is “easily overlooked,” Lewandowski said. As UW seeks to improve its campus climate and promote diversity, Deaf culture is excluded from the conversation. Each semester, there are approximately 45 to 50 students who are Deaf or hard of hearing and enrolled at McBurney, Lewandowski said. Of those, less than five use sign language. Lewandowski said it’s important to have more representation of the Deaf community at UW, and that might come if campus was more supportive. When Fonkem first came to Madison, she was afraid it wouldn’t be very Deaf-friendly. “That should not be part of high school graduates minds, that I can’t go to Madison because they don’t seem very friendly to Deaf people,” Fonkem said. Lily Hansen, president of Sign Language Club on campus, said Deaf awareness week in September wasn’t shared or promoted on campus through the university’s websites or social media pages. And before Hansen started Sign Language Club three years ago, there was nothing. Hansen tried to do a project on the history of deaf and hard of hearing individuals at UW, but there wasn’t enough information in the archives. In addition, the availability of ASL courses has been inconsistent. Historically, ASL I and ASL II classes were taught under the department of rehabilitation psychology and special education, but only in the summer and not every summer, student services coordinator Virginia Waddick said in an email to The Badger Herald. Now, ASL courses are housed in Hustad’s department: communication sciences and disorders, as a tool for therapists and audiologists to use with young children with communication delays. Hustad’s department will be offering ASL courses like these this summer, and hopefully in the future. She wishes UW could expand ASL courses into fall and spring semesters or have them count as a foreign language, but there are a lot of barriers. There are strict curriculum requirements for classes to count toward the foreign language requirement. Someone would have to create the curriculum, and it would go through a “massive set of reviews,” Hustad said. And they don’t have any faculty that can teach ASL. When they offer it in the summer, a community member teaches it. Hustad said she thinks student voices — both Deaf and hearing — could help them get the resources they need to offer ASL. She thinks campus would be supportive, it’s just a new concept. Though promoting Deaf culture can be unfamiliar territory for UW, there’ve been efforts to make improvements. 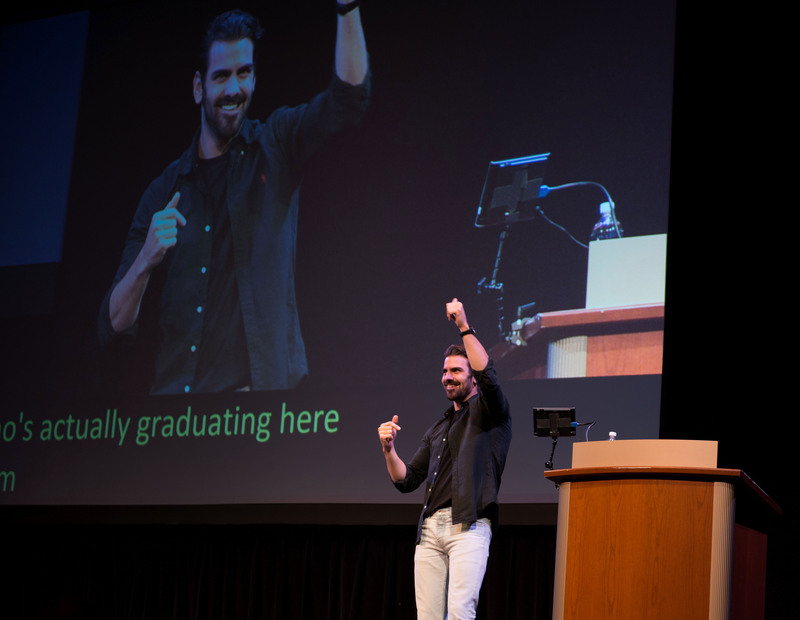 This past January, model, actor and Deaf activist Nyle DiMarco came to campus to talk about his experience as a Deaf person for the Wisconsin Union Directorate’s Distinguished Lecture Series. WUD partnered with McBurney to host the lecture and organize an event where Deaf students from UW and all around Wisconsin could interact with DiMarco. He spoke about the importance of spreading awareness of Deaf culture at UW and throughout the world. Nyle DiMarco visited UW’s campus this past January. “When the Nyle event happened I was like, ‘I’m comfortable here,’” Fonkem said. He talked with students about how to overcome barriers in a hearing world, telling Fonkem to be assertive and make sure she has the accommodations she needs when applying for jobs. When Lewandowski was a UW student from 2006-09, UW hosted a comedian who did a show in ASL. But he was an interpreter and not deaf himself. To work toward bridging the gap between hearing and Deaf communities on campus, Hansen, a hearing student, dedicates her time to Sign Language Club. Hansen learned sign language in high school and started the club at UW during her sophomore year in 2015. Lily Hansen, president of Sign Language Club, signs with her fellow students. Hansen works with Fonkem and third-year graduate Phu Duong, a deaf student who uses cochlear implants and ASL, to lead weekly meetings. They teach ASL and Deaf culture to members and lead activities that help with signing. Hansen said during her time there, the club has impacted at least 200 people — something she hopes will grow. Alongside these efforts, McBurney has provided accommodations for all deaf and hard of hearing students who need it. For classes, academic activities and clubs, they provide interpreters, real-time captioning, microphones for professors and other assistive listening devices. Duong said McBurney provides him with everything he needs to get an education. Jang said McBurney has been “excellent” in getting him the resources he needs. Still, outside of the accommodations and support that McBurney provides for students, other problems persist. While McBurney’s accommodations allow students to pursue academic goals, they don’t automatically provide accommodations for social events. Fonkem said she tries to plan out her entire semester to ensure she can get accommodations in advance for social events, but still cannot receive them sometimes. Campus organizations often deny her requests for accommodations due to money, lack of time or they simply don’t respond. Fonkem, Palm and Wciorka said they have wanted to see movies at The Marquee Cinema, but the WUD Film Committee always denies their requests to show a movie with captioning because hearing people don’t like it when the movies have captions. Captions are not only for Deaf people. The Overture Center and First Wave have also denied some of Fonkem’s requests for accommodations. Another challenge is organizations are usually unprepared to accommodate. Fonkem usually has to direct organizations to McBurney because they aren’t used to getting requests. “While the organization may not be intentionally malicious in denying sign language interpreting services, the result from this lack of access is that it makes it much harder for Deaf people to succeed or navigate in predominantly hearing spaces,” Lewandowski said. And sometimes, resistance to accommodations can extend into the classroom. Jang said when he asked one professor to use a microphone that would transmit to his ear, the professor was resistant and questioned whether Jang was trying to record the lecture. While Wciorka has not experienced a professor being resistant to giving her accommodations, they frequently forget to turn on captioning for videos. “’Are you being resistant to it, or are you just ignorant?’ is one of the big things that I have to learn and understand with those professors,” Wciorka said. Across the spectrum of deaf experiences, deaf and hard of hearing students agree that they would like more awareness and understanding from the hearing community. Fonkem hopes hearing students will take the initiative to become better informed about deaf experiences. Palm said she’d love to have more conversations with hearing students. Fonkem, Duong and Hansen hope more people will come to Sign Language Club. In addition to offering ASL courses, Fonkem said she’d like to see classes on Deaf studies as well. “If we can show that the university is more open-minded, willing to include more Deaf culture-related events or more classes, they can show that Deaf people can get a higher education here,” Fonkem said. Lewandowski said she hopes for more hearing students to be vulnerable and unafraid to ask Deaf students about their preferences. She wants to get the ASL program started and have students ask for a Deaf studies curriculum. 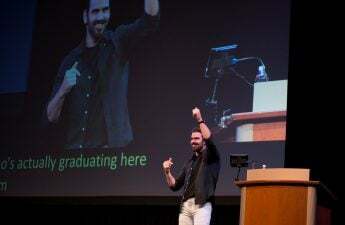 For hearing students who may feel hesitant to connect with the Deaf community, DiMarco said they simply need to take steps to start learning.